Akin to Satyrs. 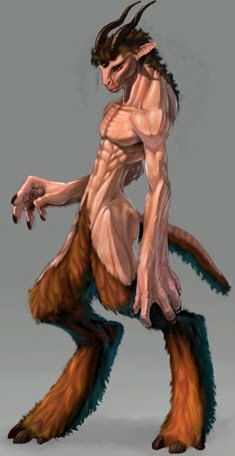 The Menahune is a fey with the hindquarters of some hooved beast, usually covered in hair, possessing incredible strength. They are a race known for their exceptional strength. Despite their size, they have strength that exceeds that of mortal men. This leads them to be the guards and warriors among the fey. They are an intense, tenacious and assertive. Menahune are among the most earthy of the fey and enjoy working with their hands. Their high strength and aggressive tendencies tend to cause menahune to choose combat over more social solutions. +4 Str, -2 Int. Menahune are almost impossibly strong for their stature, but they are not very bright on the whole. Menahune’s base movement speed is 30 feet when walking. Low-light Vision: A menahune can see twice as far as a human in dim light such as starlight, moonlight, or torchlight. Skilled (Ex): Menahune gain a +4 bonus to all Craft checks. Menahune can choose from the following as bonus racial feats: Craft magic arms & armor, Craft Wonderous item, craft psionic arms & armor, craft psionic item. Menahune have an innate magical ability to craft. They gain the following spell like abilities: Wood shape 1/ day, stone shape 1/ day, Minor creation 1/ week, fabricate 1/ week. You can cast mending at will, using your HD as the caster level to repair damaged objects. In addition, you can cause damage to objects and construct creatures by striking them with a melee touch attack. Objects and constructs take 1d6 points of damage +1 for every two HD you possess. This attack bypasses an amount of damage reduction and hardness equal to your 1/2 HD. You can use this ability a number of times per day equal to 3 + your Wisdom modifier. when something more interesting comes along. They are almost monomaniacal when they are in the midst of something. They hate interruptions and will often become angry and violent, though good ones will destroy property rather than injure others. They can be spiteful when slighted, and like many fey, become self-righteous when angered. Nightmare Menahune will often pay retribution on a family generations after the initial slight was suffered. Physical Description: Menahune have the lower body of coven-hooved animal. Their upper torso is more human like but their faces definatley have bestial attributes. Boar Menahune have red or black hair, while stag Menahune have white or brown hair with small antlers protruding from their brows. As they grow, their animal features can change over time. Relations: Menahune do not usually get along well with dwarves. Dwarves find Menahune unreliable, and Menahune find dwarves too serious to bear for long. When a Menahune’s temporary goals coincide with those of a dwarf, however, they can become fast friends. Other races have mixed reactions to a Menahune, and vice versa. Humans fear and respect them, and smart ones will not take any aid they offer for granted. Menahune appreciate such grateful humans and will do their best to make their lives easier. The ungrateful, however, commit a grave transgression and will be punished. Language: The Menahune tongue is a series of gutturals combined with the dulcet phonemes of Sylvan. It is a difficult language to speak properly, and is impossible to write faithfully. Adventurers: A Menahune might seek a brief respite from the weighty issues of court politics and set out into the world as an adventurer.